New York SAG-AFTRA actress in theatre, television and film. I've held principal roles in several independent films, commercials, infomercials, voice-overs and a Long Island Cablevision TV variety show. I studied at many acting schools in NYC. I am a professional singer, songwriter and recording artist who sings genres from pop, jazz, and classic rock to musical theatre and cabaret. I am currently working on a new album of my own songs that I hope to release soon. My most recent musical recording is an inspirational song where I wrote both music + lyrics to THERE ARE ANGELS. It was recorded with a string orchestra to Frank Owens' brilliant arrangement and won several songwriting contests. My previously released CD Cheryl Metrick: Fantasy & Romance is a recording of one of my NYC cabaret shows. It's a combination of contemporary adult pop, old standards, & musical theatre with Frank Owens' arrangements. I performed at many of the New York Catskill Mountain resorts and hotels as well as cabaret clubs, charitable events, and industrials in NYC and the tri-state area. NEW: I recently collaborated on a book with Jeree Wade, M.A., a life coach and fellow singer, On the Wings of Inspiration: Exploring Your Inner Life through Interpretive Symbols (Xlibris Publishing.) Based on a collection of my drawings and poems, the premise of the book is not only to explore the interpretation of the art itself, but to journey into the drawings to find more personal meaning within. With Jeree's commentary, a guided process supports the reader to move into a place that is more peaceful and centered to understand and implement life's lessons. The softcover is now available through Amazon.com and BarnesandNoble.com and the hardcover only through Xlibris.com. The ebook (Kindle/Nook book) is available from all the above. Just Released - new CD - On the Wings of Inspiration: 13 Meditations. I wrote and recite these meditations - Frank Owens composed and plays the music. These guided meditations are journeys of the mind. Now available on CDBaby.com, Amazon.com, ITunes, Rumblefish, Shazam, GreatIndieMusic, 7digital, 24-7, Tradebit, and Google Music Store or special order at your local music store. My Facebook page called Cheryl Metrick: THERE ARE ANGELS is dedicated to my song and to angels in general. It quickly gained a large worldwide fan base. I also have many international fans on Radio Airplay, an internet radio station. My interests include spirituality, music, acting, art, poetry, writing, humanitarianism, ecology, prevention of cruelty to animals, old movies, reruns of Twilight Zone, and just about anything by Frank Capra, Hitchcock or Spielberg. 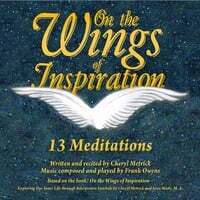 ON THE WINGS OF INSPIRATION: 13 MEDITATIONS - available on CDs & Digital @ CDbaby.com (800-289-6923), Amazon.com, and many other venues picking it up very soon. CDs: ON THE WINGS OF INSPIRATION - 13 Meditations; THERE ARE ANGELS; and FANTASY AND ROMANCE: CDBaby.com, Itunes, Amazon.com, this website, Rumblefish, Shazam, GreatIndieMusic, 7digital, 24-7, Tradebit, and Google Music Store or special order at your local music store.